The following bubble styles are supported: Bar, Cylinder, Cone, Inverted Cone, Pyramid, Inverted Pyramid, Sphere, Circle and Diamond. The Circle and Diamond styles display bubbles that do not have depth dimension. This makes it possible for the 3DChart component to apply Z order to them so that larger bubbles never overlap smaller ones. If you want to achieve a more visually appealing effect, you could use the Sphere bubble shape. 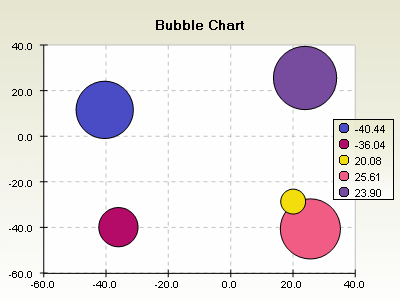 By using axis positioning techniques, the user can display the axes as a cross, or behind the bubbles.